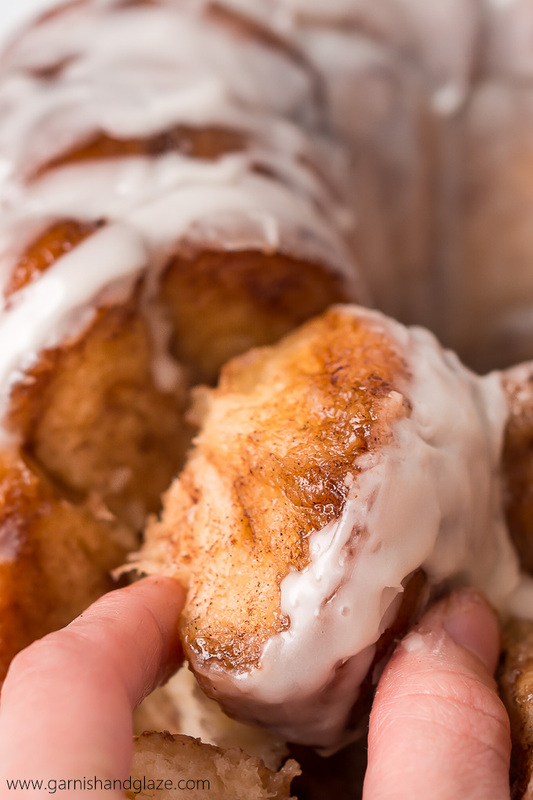 Gather round the table with your family for some Glazed Monkey Bread– irresistible fluffy, buttery, cinnamon and sugar coated balls of bread, covered in a creamy glaze. 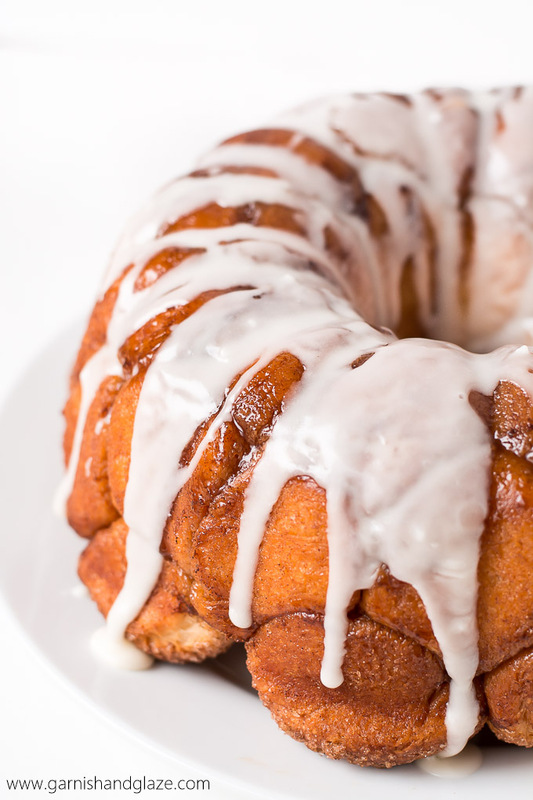 Why is this called monkey bread? Well, it’s not made of monkeys. Ewww! 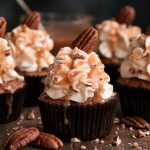 It’s probably because you go completely crazy after the first bite, throw politeness out the window, and start picking at it while oohing and aahing. 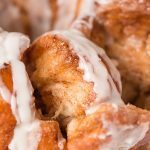 This Glazed Monkey Bread is amazing and the perfect treat (or breakfast) to share with your family during the holidays. Nothings better than rubbing elbows with your family around the kitchen table eating yummy food! So this is basically just version of cinnamon rolls but the cinnamon and sugar is on the outside and becomes sticky and caramely. mmmmm. My favorite cinnamon rolls take about 4 hours to make and even though it is so worth the time (most of which is waiting for it to rise), sometimes I just don’t want to be patient. This recipe for Monkey Bread uses quick rise instant dry yeast so it cuts the rising time in half. Score! 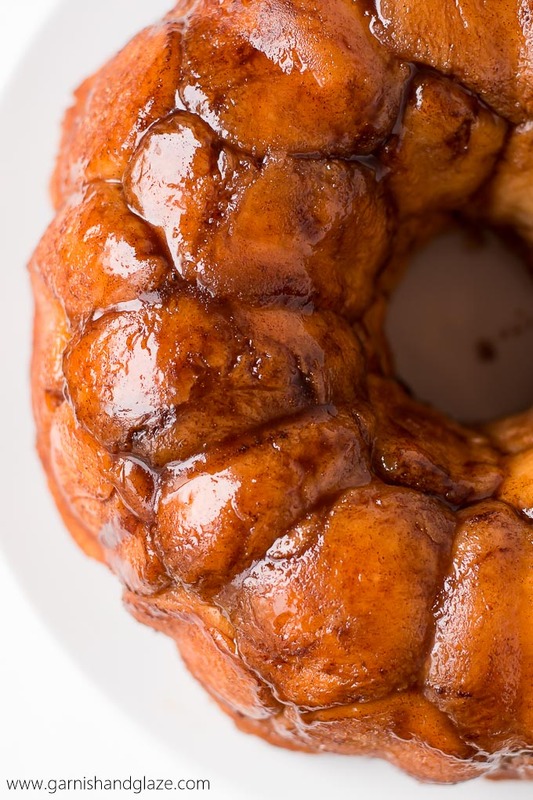 This Glazed Monkey Bread is also great because you don’t have to stress about making it look perfect. My two year old daughter wanted to help me roll the dough into balls but unfortunately when children try to “help” in the kitchen it ends up making things more difficult. Instead of rolling the dough into a ball she thought it was a better idea to make flat circles or just keep the piece of dough as a blob. It’s all good though. 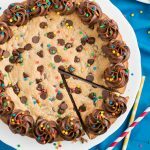 The chunks of dough smush together anyways so let your kids join in and make whatever shape they want. It’s not the healthiest but the soft fluffy bread, loads of butter and sugar that make a gooey caramel mess, make it simply irresistible. But don’t stop there! 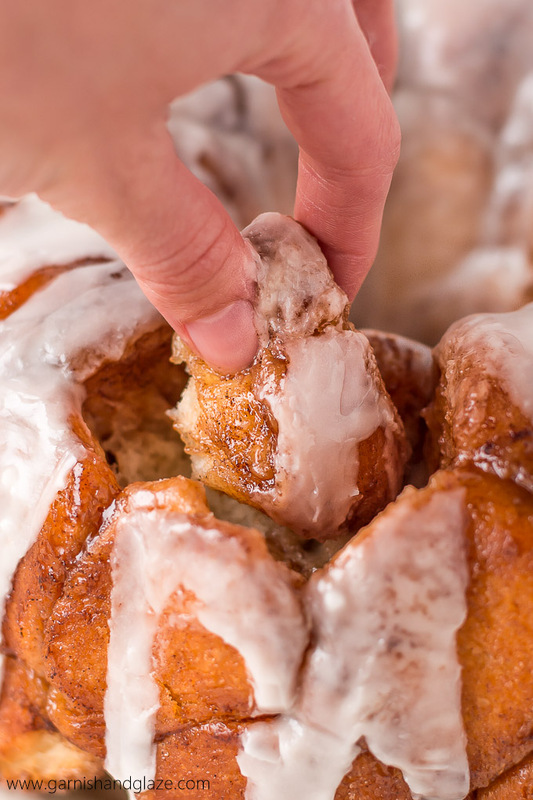 Load on the sugar and add the delicious creamy glaze! BOOM! Cinnamon roll bites! Enjoy! Mix together yeast, warm milk, and 1 tablespoons sugar in a bowl of a standing mixer fitted with a dough hook (you can also just do this by hand) and let it dissolve for 5 minutes. Mix in the butter, 1/4 cup sugar, egg, salt. Start adding in the flour while mixing, adding 1 cup at a time until you've added 4 cups (scrape sides of bowl as needed). Mix on low for 5 minutes, adding a couple tablespoons of flour at a time if the dough gets too sticky. Place dough in a large greased bowl and turn the dough over so the top is greased. Cover with a towel and let it rise for an hour. Melt the 10 tablespoons butter in a bowl. In another bowl, mix brown sugar, granulated sugar, and cinnamon. Pinch or cut off dough into 1 1/2 inch pieces. 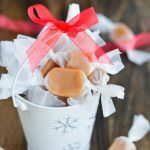 Roll into balls (use flour as needed), dip in melted butter, and roll in the sugar mixture. Toss the coated balls of dough into the greased pan. Mix remaining butter and sugar mixture together and pour over the balls. Cover the pan with plastic wrap and let rise for 30-45 minutes. Preheat oven to 350 degrees F. Bake for 25-30 minutes until golden. Let cool for 5 minutes and then remove onto a platter. Heat cream and butter together in the microwave until melted. Beat in vanilla and powdered sugar until desired consistency. 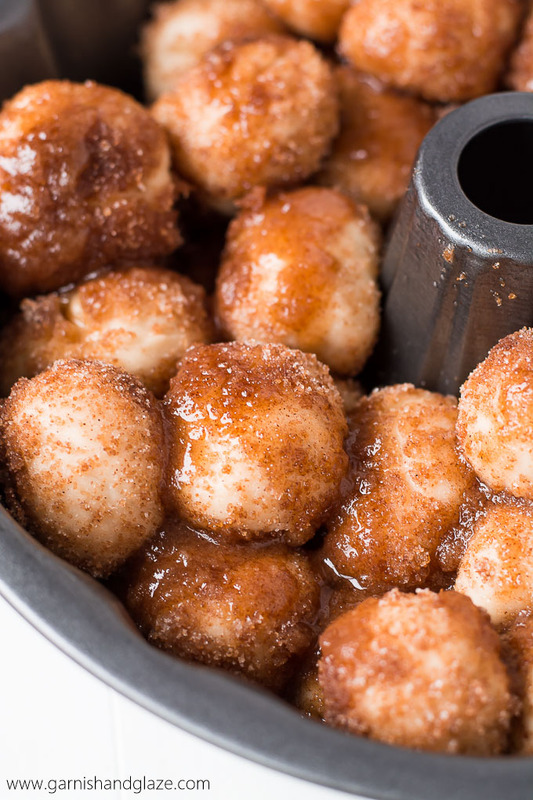 Pour over the warm Monkey Bread. Serve. I first shared this recipe on Handle the Heat where I was a contributor. 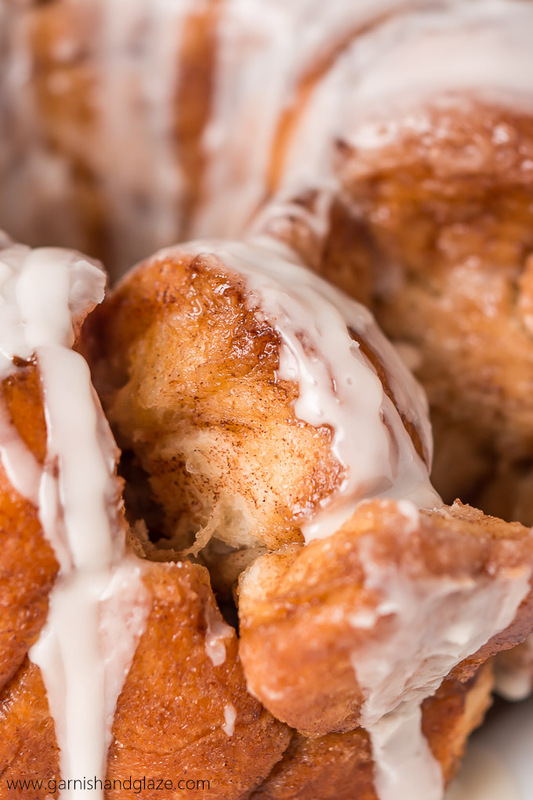 I’m convinced that there is actually nothing better than Monkey Bread, it’s amazing. So true Paige! It’s divine! Was I supposed to mix in the melted butter in step two, I ended up skipping it as I was just going by the instructions. I’m soooo sorry Georgie! Just fixed it. 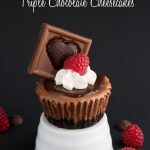 It should still turn out… just a little less fattening!